The first earthquake on December 20 and one of about the same intensity on December 24 are described together. Their epicenters lie in the same general region west of Whittier, New Hampshire. Although the second shock was of less duration, it was somewhat more intense than the first. However, the first shock undoubtedly weakened structures, which resulted in more severe damage from the second earthquake. The town of Tamworth, on the edge of the Ossipee Mountains in central Carroll County, sustained the most damage. Old houses and chimneys in need of repair were most commonly damaged. Some chimneys were thrown down, and 20 others were damaged. Also, reports indicate that well water remained muddy for several days and that many cracks formed in the crusty snow. Other minor damage included cracked walls, broken water pipes, fallen plaster, and broken furniture. At the Riverside Cemetery at Whittier, about 3 kilometers south of Tamworth, five monuments were displaced. In the nearby towns of West Ossipee and Chocorua, many old chimneys in need of repair were damaged, and water in wells became muddy. At Wonalancet, 8 kilometers northwest of Tamworth, the foundation of an old house (constructed of heavy timber) was damaged when it shifted about 30 centimeters. Heavy furniture, including a kitchen stove, moved several centimeters across the floor. Minor damage occurred at several towns in Maine, Massachusetts, New York, and Vermont. Reports of the shock also were received from Connecticut, New Jersey, Pennsylvania, and Rhode Island, as well as from Montreal and Quebec, Canada. Several small aftershocks occurred over the next several months. June 11, 1638, 2:00 p.m.
Central New Hampshire: The location and damage levels are very uncertain because settlements were sparse and reports were few. Shaking was felt strongly along the St. Lawrence River in Canada and in Boston, widely but less strongly across southern New England, and on ships near the coast. Aftershocks were felt for 20 days in eastern Massachusetts. At Newbury, many stone walls and chimney bricks were shaken down, and almost all tops of chimneys were knocked off. Considerable changes occurred in the flow of water in springs and, in some springs, changes occurred in the character of the water. "Some firm land became quagmire, and marshes were dried up." The rise and fall of the ground made it difficult to walk, and houses shook and rocked as if they would fall apart. Sand blows were reported near Spring Island. 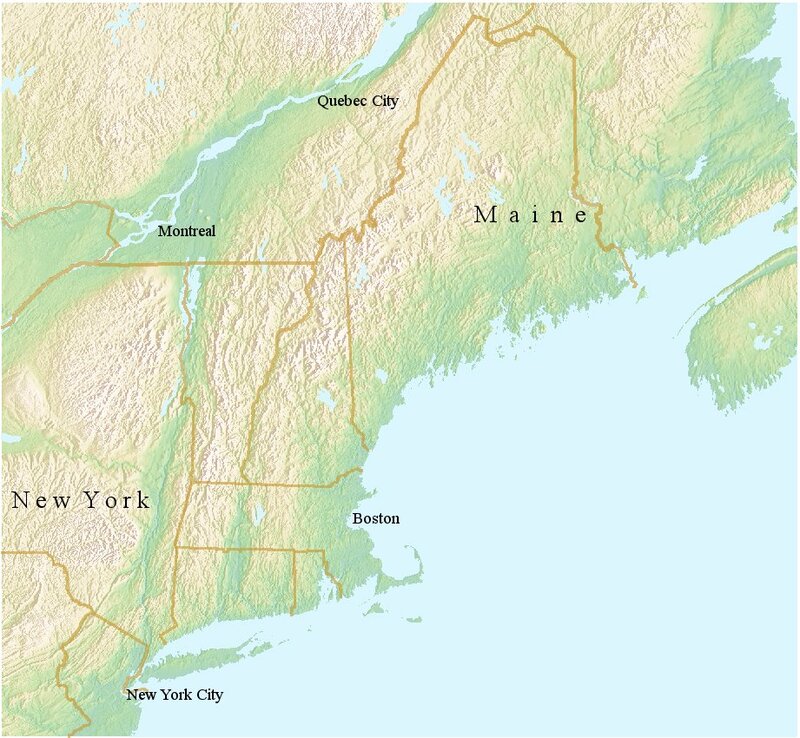 Felt from the Kennebec River in Maine to the Delaware River on the New York-Pennsylvania border and from ships at sea to the "extreme western settlements." Aftershocks occurred in the area for several months. The strongest aftershock (MM intensity V) occurred in the Newbury area on Dec. 28, 1727, and Jan. 4 and Feb. 10, 1728 (local dates). Cape Ann, Massachusetts: At Boston, about 55 km (34 mi) southwest of Cape Ann, effects were strongest on infilled land near the wharves. About 100 chimneys were thrown down, and as many as 1,500 others were damaged. Walls of several brick buildings fell. Stone fences fell throughout the countryside. Springs formed or stopped. In eastern Massachusetts, ground cracks opened; some emitted sand and water. Aftershocks were reported. Shaking was felt from Nova Scotia to Maryland, and from New York State to a ship 320 km (200mi) at sea. Those aboard the ship thought it had run aground. Easternmost Maine: Chimneys fell, in an near, two towns in Maine and one in New Brunswick. Shaking was felt throughout most of New England, Nova Scotia, New Brunswick, Prince Edward Island, and southeastern Quebec. One foreshock was reported and more than 14 aftershocks were reported over the next two and a half days. New York City: Chimneys and bricks fell and walls and plaster cracked in Connecticut, northern New Jersey, southern New York, and eastern Pennsylvania. The earthquake was felt from southern Maine to central Virginia, and westward to northeastern Ohio. Three strong shocks occurred; the second was the strongest. Slight aftershocks occurred on Aug. 11. At Blue Mountain Lake, one old chimney collapsed, about 20 tombstones slid or rotated, and some minor cracks formed in plaster walls. Several landslides were reported. Light damage also occurred at several other towns in the area, but the most common effects were cracked chimneys, broken dishes or glassware, and overturned or fallen objects. Although this earthquake caused only minor damage, it was felt over a wide region, including two Provinces in Canada and 12 States. Apr. 20, 2002, 10:50 a.m. Some roads, bridges, chimneys and water lines damaged in Clinton and Essex Counties. Many buildings in the area had cracked walls and foundations, broken windows and small items knocked from shelves. Maximum intensity (VII) at Au Sable Forks. Felt from New Brunswick and Maine to Ohio and Michigan and from Ontario and Quebec to Maryland. This severe earthquake was felt from Canada south to Maryland and from Maine west to Indiana. It caused property damage estimated at $2 million at Massena and Cornwall. Many chimneys in that area required rebuilding, and several structures were unsafe for occupancy until repaired. Residents of St. Lawrence County reported that many water wells went dry. At Massena, in northern St. Lawrence County, 90 percent of the chimneys were destroyed or damaged and house foundations, plumbing, and masonry were damaged severely. Similar effects were reported at Cornwall. Cracks formed in the ground at Hogansburg, and brick-masonry and concrete structures were damaged. Chimneys were downed in several towns in New York, including Fort Covington, Keeseville, Malone, Norfolk, Ogdensburg, and Waddington. Jun. 23, 2010, 5:41 p.m.